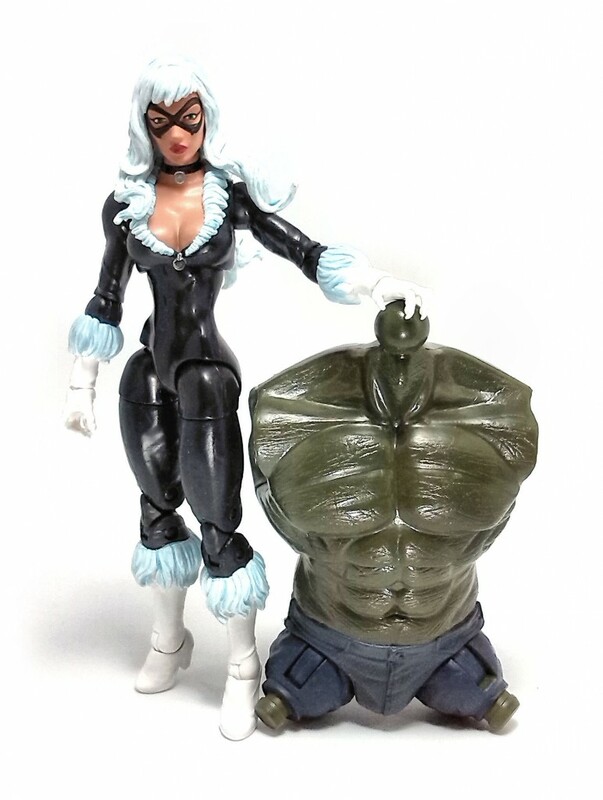 Action figures based on female comic book characters are less of a rarity these days, but Hasbro’s Marvel Legends line does not often include them in their line-up. There are a few reasons, ranging from outdated marketing mantras (“Female action figures don’t sell”), to actual issues with the appearance and quality of the figures produced, but for the Black Cat figure released as part of the assortment from the Marvel Legends Infinite Series dedicated to the second Amazing Spider-Man movie, at least the last part seems to not be a problem. The mold used for Black Cat is not entirely new, as parts of her anatomy had been used before, but there are a few interesting additions to her costume in the form of furry neckline, glove and boot cuffs. These furry bits are actually separate molds glued onto the black plastic pieces, for a nice, clean color separation. Her overall appearance is very athletic and on top of it all is a really pretty head sculpt, complete with locks of flowing white hair. As you’d expect, the range of movement at the neck is somewhat impaired by the hair, but also the hip joints have a fairly reduced range because the upper thigh pieces are rather bulky and prevent lateral extensions. One other thing worth mentioning is that rocker feet may not be such a great idea for characters that wear high heels such as this one, as the usefulness of the joint depends on the amount of contact surface at the soles of the figure. As it stands (or not), Black Cat needs additional support to keep upright for long periods of time. Black cat was molded in black and white plastic, with minimal paint applications on them. The exposed skin is painted in flesh color and the eye and lip applications are very neatly done, although the edges of her mask could use a little work. Black Cat comes with a whip accessory that has a silver claw at the end. Also included is the torso piece required to build the Ultimate Goblin figure. Overall I am quite pleased with the Black Cat. Sure, she may need a doll stand for display purposes, but the figure is really pretty and oddly enough, she can be quite stable on more dynamic poses.